We are seeking a new Executive Director to lead our growing museum with exciting new partnerships. See the job description and instructions for applying here. Please visit our Facebook page for the most up-to-date news, events, and opening hours. The Historic Camden Foundation is a private 501(c)3 non-profit museum whose mission is to protect, preserve, and celebrate Camden’s extraordinary Colonial and Revolutionary War history. 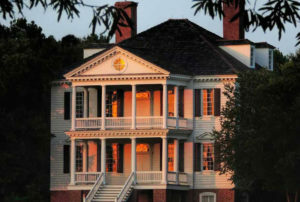 Our 107 acres sit atop the original 18th-century property of the city’s founder Joseph Kershaw and the fortified Revolutionary War-era town occupied by British General Cornwallis and Lord Rawdon’s men from 1780-81. Visit the site to learn about the prolific Kershaw, Camden’s importance to the war’s Southern Campaigns, and Colonial life in the backcountry. Explore the reconstructed Kershaw-Cornwallis House and recently rehabilitated c. 1800 McCaa’s Tavern, as well as exhibits in other period structures. Join us for tours, programs, and events! See our Admission & Tours page and our events calendar to plan your trip. Historic Camden is excited to announce that we have recently assumed ownership of 476 acres of the Battlefield of Camden. The Battlefield is hallowed ground for the hundreds of men who died in this significant battle that took place August 16, 1780. Historic Camden is dedicated to telling the story of this fascinating battle, preserving and studying the archaeological evidence of the site, restoring the Longleaf Pine forest that existed during the 18th century, and providing a space for a variety of outdoor recreational activities. Visit the Camden Battlefield page for more information! Both the original Historic Camden campus and the Battlefield are on the National Register of Historic Places. Historic Camden is a National Park Service affiliate. Historic Camden is proud to partner with the City of Camden, Kershaw County, Central Carolina Technical College, and others for the upcoming Visitors Center and Revolutionary War center next door to our site! Read more about it here. We received a $200,000 grant from the SC Dept. of Parks, Recreation, and Tourism towards deferred maintenance work and renovations for our historic structures. Stay tuned for updates! Want to make your next event a BLAST? We now have two 3-pound grasshopper cannons, two Coehorn mortars, muskets, and a uniformed cannon crew who can travel to your site to demonstrate, educate, and entertain. See our Cannon page for more info. The March 23, 2019 Revel grossed a record $50,000 to support our mission! Thank you to all of our donors and sponsors. Our renovated Southeast Redoubt exhibit was unveiled on March 9, 2019! Read more about our supporters and all the hard work our volunteers did here and here. Our wonderful volunteers at the Camden Battlefield and Longleaf Pine Preserve completed 18 months of hand-clearing non-longleaf trees that was mixed with young longleaf in our "Educational Acres". Stop by the Battlefield Preserve to see the start of our decades-long reforestation efforts to bring the forest back to its 18th century roots, and follow the project on Facebook. Donate to Historic Camden Today!